Illustration of a white dwarf siphoning material from its companion star. Over time, the white dwarf star can no longer support its own weight and implodes, creating a Type Ia supernova. NASA's Kepler space telescope captured the light of a stellar explosion that occurred about 170 million years ago. When a massive star reaches the end of its life, a bright explosion expels stellar material into space, in what is known as a supernova. Using the now-retired Kepler telescope as well as ground-based telescopes, astronomers detected the bright light of a supernova called SN 2018oh on Feb. 4, 2018. "With the combined data from these telescopes, astronomers achieved what they had hoped for — an unprecedented observation of the onset of a supernova," NASA officials said in the statement. SN 2018oh resides in the spiral galaxy UGC 4780, in the Cancer constellation. It is classified as a Type Ia supernova, which typically brightens over the course of three weeks before gradually fading away. However, this supernova, which Kepler observed only a few days after the initial explosion, brightened about three times faster than a typical supernova at this time period before reaching peak brightness, according to the statement. Data from the ground-based telescopes revealed a blue hue, indicating the supernova is extremely hot. Additionally, using the data from the Dark Energy Camera at Cerro Tololo Inter-American Observatory in Chile and the Panoramic Survey Telescope and Rapid Response System at Haleakala Observatory in Hawaii, astronomers are able to study the evolution of dark energy, which is the mysterious force responsible for the universe's accelerating expansion. As a Type Ia supernova, SN 2018oh is a prime example of the type of supernova that astronomers can use to track dark energy and the expansion of the universe, according to the statement. Astronomers have proposed two theories to explain the Kepler observations. The supernova could be the result of a single white dwarf star that siphoned material from its companion star, causing it to implode. 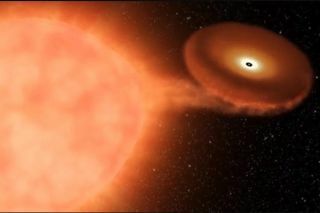 The shock wave from the exploding white dwarf would have then collided with the companion star, creating the extremely hot, bright observations. Alternatively, the added brightness and heat could be caused by nickel in the outer layers of the exploding material. However, more research on Type Ia supernovas is needed to determine how they form and evolve. This, in turn, will help astronomers accurately model the expansion rate of the universe, according to the statement. Although Kepler has run out of fuel and was officially retired on Oct. 30, over the course of its operational life it detected more than 40 supernova candidates that will continue to be studied. The observations of SN 2018oh are detailed in three new research papers: one that has been accepted for publication in The Astrophysical Journal Letters, and two others that have been accepted by The Astrophysical Journal.